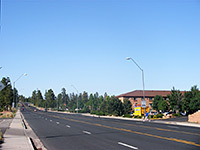 The population of Tusayan is only around 550 but the town receives huge numbers of visitors each year since it lies at the main (south) entrance to Grand Canyon National Park, along US 180 from Flagstaff (72 miles). There is however no sign of the canyon in town, which is surrounded by thick pine woodland of the Kaibab National Forest, crossed by several unpaved tracks which lead to free primitive camping locations, an alternative to staying in the national park or the limited number of hotels. 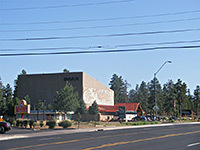 All facilities are located along the highway, over a distance of just over half a mile; they include a few shops and restaurants, the Grand Canyon IMAX Theater, a post office and RV site. Grand Canyon Airport is one mile south, offering sightseeing trips and scheduled flights from Boulder City and Las Vegas; more services will follow upon completion of a new terminal around 2020. One of only two chain hotels in Tusayan, the Holiday Inn Express is just two miles from the southern entrance station to Grand Canyon National Park along US 180, and 6.5 miles from most people's first sight of the canyon at Mather Point. The hotel is situated in the middle of Tusayan village, within easy walking distance of all its rather limited facilities, which include a small selection of restaurants and shops, the airport/helicenter and the Grand Canyon IMAX theater. There are 164 single rooms on offer in the main accommodation block, all nice and clean, and equipped with a microwave, coffee maker & ironing facilities; some have a refrigerator. Also available are several kinds of suite including KidSuites, catering for up to 2 adults and 3 children. The other main facilities of the Holiday Inn Express Grand Canyon are an indoor pool, whirlpool, and free continental breakfast. Immediately south of the Holiday Inn Express stands the Best Western hotel in Tusayan, at 100 Highway 64 (US 180), on the west side of the road. This Grand Canyon hotel is rated AAA 3 diamond, and offers a good choice of leisure facilities - a seasonally heated outdoor pool surrounded by pleasant gardens, a hot tub, fitness center, sauna, bowling alley, games room and tanning beds. Also in the 250 room hotel are a sports bar/lounge and two restaurants (Coronado Room and Canyon Room), the latter serving free continental breakfast. McDonald's and Pizza Hut are the two nearest off-site dining outlets. Grand Canyon airport is just a short distance south of the hotel, from where regular sight-seeing flights depart for trips over the national park.